One very critical principle that is taught in the Bible is the principle of authority. We understand this concept. 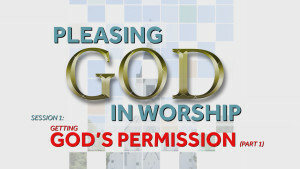 We understand that there are things in life that require permission. Authority was given by God to Christ; Christ in turn imparted to the apostles; the apostles then embedded God's authority, so to speak, in Scripture; and now Scripture is the means by which we receive permission from God. So how can we know what God approves? How do we decide God's wishes on any given action? Clearly, we must go to God's Word and weigh every idea in view of God's directives. We must approach the Bible with the constant humble question: “Lord what would you have me to do?” This question applies in the matter of how I spend my money, in the matter of how I treat my spouse or my employer, and in the matter of worship. 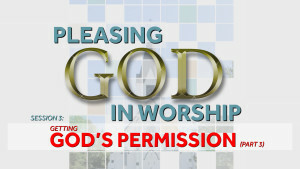 What does God want you and me to do while worshiping Him? From the very beginning of human history, God has required people to structure their behavior based upon His will, and therefore we human beings have no right to formulate our own ideas concerning religious truth. We must have God's approval for everything we do. Another way to say this is: “Are we going to allow God to govern our lives or not?” In Acts 4:7 the Jewish authorities asked the apostles, “By what power or by what name have you done this?” Can we answer, as the apostles did, that our actions in worship have their authority from Christ? When you attend a sporting event, do you find yourself getting excited? Maybe expressing your excitement by clapping? When you attend a concert, do you express your approval and appreciation by clapping for the performers? 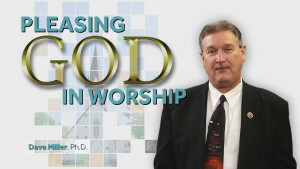 Well, someone asks, "Since this is just part of our society, is it not just as natural and just as appropriate to clap when worshiping God?” How do we decide that? Since the God of the Bible expresses Himself in the Bible regarding how to worship Him, it only makes sense to go to the Bible and allow God Himself to tell us how He expects to be worshipped. What does the Bible say in regards to applause in worship? 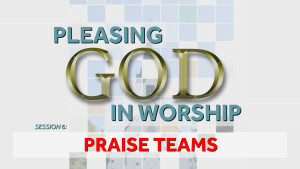 A very popular feature of Christian worship assemblies in churches all over the country, is the matter of praise teams. Typically, a praise team consists of anywhere from 4 to 15 men and women. They have their own microphones, separate from the congregation. Sometimes praise teams remain seated among the congregation, or on the front pew, while other times they may stand in front facing the congregation. 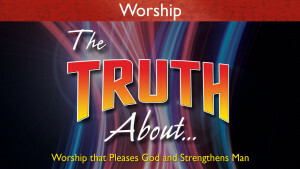 Are the use of praise teams in worship justified by Scripture? All practices, all actions, all worship activities must be examined in light of God's Word. 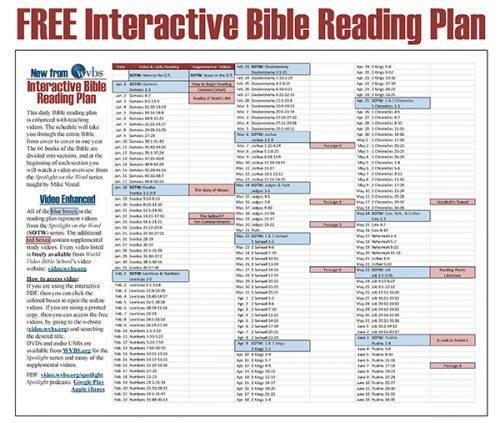 Can we go to the Bible, using the principle of authority, and see where God wants us to engage in this practice?